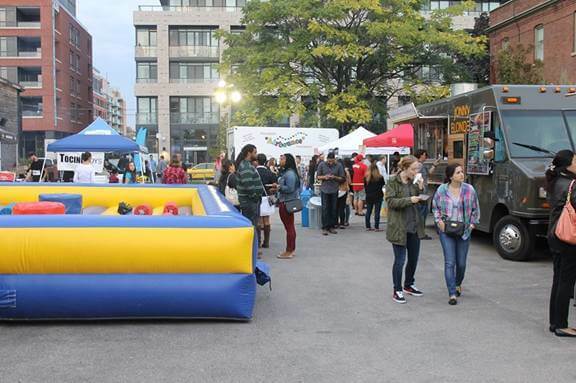 Foodies On Foot had ‘carnival’ in mind when they were designing their last event that took place on Sunday. They envisioned a fun food event where chefs would serve up once childhood favorites transformed into food creations with an adult twist. After months of planning and hard work, voila Foodival. 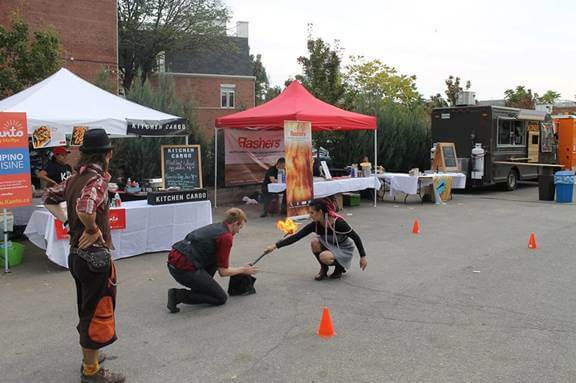 The daylong event featured many fun carnival elements such as fortunetellers, fire dancers, and mini attractions that raised funds for ‘Real Food for Real Kids’. All of the vendors were small, independent, and local eateries from across the city and a handful from surrounding areas. What set this event apart from others was the amount of passion and contagious enthusiasm the vendors displayed. The food was made with such love and care and the owners of almost every establishment were present to ensure that guests received only the best. Rashers, a small eatery that has only been open for a year and focuses on locally sourced ingredients for their menu was one of many vendors. I tried the Hogtown Slider, which is one of their signature sandwich and it was delicious. The meat was fresh as it is naturally raised and the unique mustard they used for this slider was made in house, as are all their sauces. 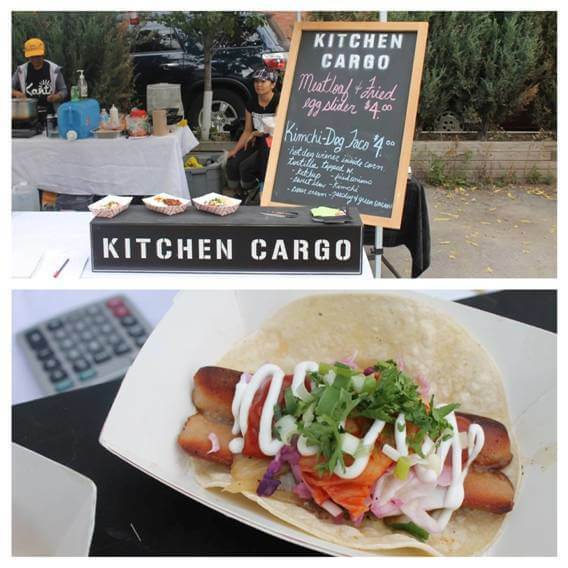 Kitchen Cargo from Market 707 debuted their Kimchi Dog; a hot dog wiener inside a corn tortilla topped with ketchup, fried onions, sweet slaw, kimichi, sour cream, parsley and green onion. It was a great combination and a perfect twist to my guilty pleasure the hotdog. Jennifer, the owner, explained that she enjoys adding an extra level of creativity to traditional comfort foods. 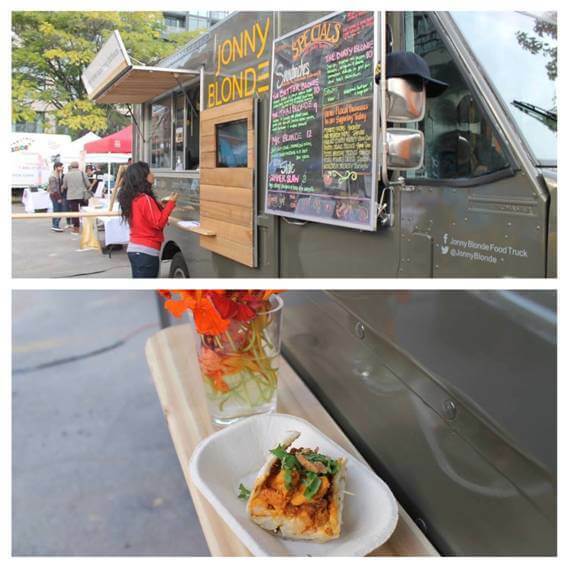 Jonny, a high school dropout who later completed a degree in economics and then decided to pursue his passion for food, transformed a Purolator truck into a mobile eatery called Jonny Blonde. Jonny Blonde focuses on fusing international flavors and transforming popular local dishes into his unique fusion creations. I tried the Butter Blonde, a sandwich made with tandoori chicken in Jonny’s cashew butter chicken sauce served with cauliflower, melted brie, and candied almonds. Odile a local chocolatier showcased a variety of chocolate from her shop. She was raised in Paris and learned the tricks of the trade from her mother when she made truffles in her Parisian kitchen as a little girl. You can find her shop in Dundas West. Foodies On Foot Cofounder Gloria Czomko, dubbed Odile “the best chocolatier in the city” and I must agree. 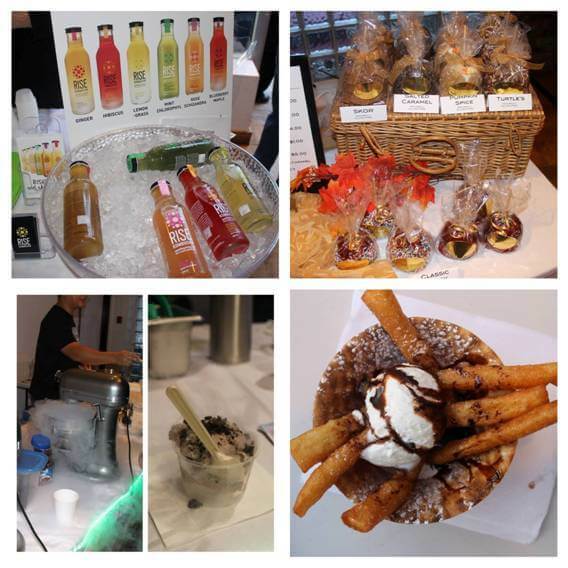 The event showcased a variety of vendors with a variety of flavors; RISE Kombucha provided samples of their delicious fermented tea that enhances vital energy, balances digestion and detoxifies. Redline, a local Cabbagetown café served up cotton candy lemonade. Golden Apple from Liberty Village had the most amazing candied apple I have ever tasted in my life. Ice Volcano, a local catering company, served up delicious liquid nitrogen ice cream. La Dolce, a local foodie studio was also present showcasing over 20 food classes they offer such as creating macarons. As a sweet ending to my culinary adventure, I tried funnel cake fries from Mike’s Dog House and they were the perfect combination of funnel cake, ice cream, chocolate sauce and an edible wafer bowl. You can find Mike’s Dog House on the University of Toronto’s Mississauga campus to get your fix. His story is simple; small town guy discovers his long lost self in an urban wonderland. Through this five-year journey of self-discovery, he has transitioned from simple Kamloopsian to fashionable Torontonian. As a devout Torontonian, he always keeps up to date with what’s happening in the city. Sultan considers himself to be a foodie and brunch fanatic. You will find him obsessed with discovering new eateries, art events, and entertainment in the city. He’s that guy who will be rushing to Nadege for an emergency box of macarons after a rough day. Throughout the year, Sultan can be spotted at local events such as Fashion Week, Nuit Blanche, Art Toronto, Digital Dreams, and TIFF just to name a few.